This is the beginning of a three part series on The Law and Love. We will look at how God gave us His law out of love, how His character and our nature are revealed in the Ten Commandments, and the importance of our loving response to His law. Gen. 1:1 In the beginning, God created the heavens and the earth, that’s everything; then he created man and a woman and there was a relationship between the Creator and his creatures. Was the man and woman the first family? Not in the strictest sense. It was in that a family is one husband and one wife - male and female. The family is also one union made up of two or more persons. John 1:1 sounds a lot like Genesis 1:1, it says: In the beginning was the Word, and the Word was with God, and the Word was God. 2 He was in the beginning with God. 3 All things were made through him, and without him was not any thing made that was made. And of course the “Word” here expressed is the second person of the Trinity - Jesus Christ, the only begotten son of God. Gen. 1:2 tells us that the Spirit of God was hovering over the face of the waters. So before man was created there was, pre-eternally, God the Father, God the Son and God the Holy Spirit - three persons making up one union. So in a general sense we may say that family life existed within the Godhead. God counseled within himself to create and manifest his Glory. Some scholars today get this confused, they think that God gave the law to Moses and that’s the first we see of it. The law that God gave to Moses was actually a re-publication of the law that God had hardwired into us at creation. Why did God do this? God so loved the world that he gave us his law. God as Father was sharing his family values with his children so that we could reflect His character. What parent doesn’t understand that? To guide and protect our children we teach them our values and give them limits and if they go beyond those limits we discipline. Why? Because we love them. God gave us the law out of love, to assure us that we were his own, that we would reflect his values, that we would have dignity, that we would be in a unique intimate relationship with Him. God wrote the law on our hearts and what a beautiful thing that was to do. But something went terribly wrong in the garden didn’t it? God’s words are the words of life! To seek meaning and purpose from any source that is not compatible with the Word of God is sin. So what happened to us in the garden. Adam sinned and all in Adam sinned. 1. “All have sinned” is a judicial declaration of guilt. We went against God’s Word, we broke the law and now we carry a curse. 2. We fell short of the greatness we were made for. We did not act like our Holy Father. We acted like rebellious Satan. Instead of displaying the greatness of our family we acted as if Satan himself was our father. Where did our greatness go? Where did our dignity go? So God re-published the law, not to give us a way to earn salvation, but to show us what His character is like and how far we had fallen from our family image. So the law is good for it tells us of the character of God and what he values. He values relationships. Yet, because the law contains the image of our original dignity it demonstrates our falling short and condemns us. We must study the law to learn about ourselves, our relationships and about the character of God. 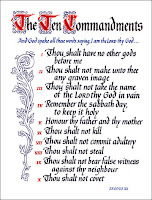 Even a brief overview of the Ten Commandments reveals much about our great God and about ourselves. In the next installment, we shall do just that.